Windows only: WindowsPager is a free and light-weight application for managing virtual desktops. The application is just over 300k and uses around 5MB of system memory. Windows Pager requires no installation or administrative rights to run. 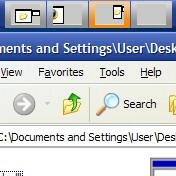 After running the executable a small bank of four screens—see the screenshot at left— is placed on the Windows taskbar. Clicking on one of the four panes in takes you to one of the four virtual desktops. On a multiple monitor setup, WindowsPager treats all of the monitors as one enormous desktop and cycling through the virtual desktops will fresh all of the multiple monitors accordingly. WindowsPager was quick to respond to changes and bring up the new windows for each virtual desktop. WindowsPager is a free portable-application, Windows only.